This is one of my favorite pictures of my brother Daniel and I. Other than this other awesome picture of us, this one is at the top. I must be in kindergarten, because after that year I grew out my bangs and have never gone back. My aunt snapped this one while we were hanging out at the community pool, making...holes, apparently. I have many wonderful childhood memories of going to the pool. And then later memories of high school, where I walked around wishing I were more popular and hoping a cute boy would randomly come over and talk to me. Alas, real life at the pool (mine, at least) was not quite as magical as a movie. Still, I'm glad I have pictures like this to remind me of the good days. Days when I wore a one-piece, flower-patterned swimsuit and rocked straight bangs. 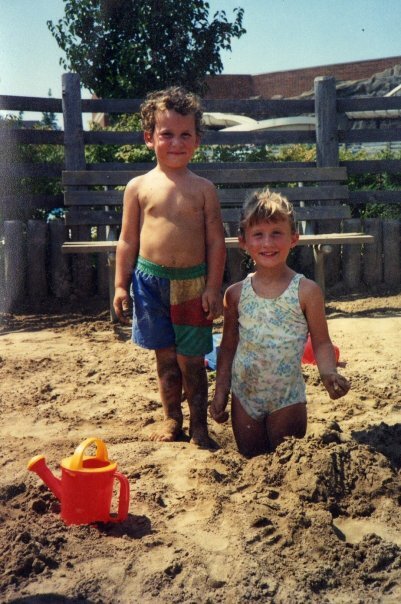 Days when digging a huge hole with my brother was all I needed to feel complete. Linking up with Lauren for this week's Flashback! Umm, this is at a community pool?! You had sand?! I'm impressed. Especially since it's Illinois. That's legit, man. That is a DEEP hole! You all were putting your backs into it and getting it done. Impressive! How does your community pool have a BEACH?! Seriously, I've never been to one as classy as that. In PA you're lucky if you get a grassy hillside. I think you could totally pull off that look again. The floral pattern + straight bangs = so hipster. Only you'd have to call them "fringe" instead on bangs if you were a hipster. I also think that Austin is sorely underrepresented in Flashback Fridays. Please remedy. For his sake. Pleaseandthankyou. Audra, I didn't realize community pools usually don't have a sand area. It *was* a pretty legit pool, though! And you are so right about Austin. I will have to do something about this immediately/next week. Heidi, it was a pretty deep hole for a six-year-old, though I'm sure I would be much less impressed now! AlyGatr, pools really are fun!